I recently led a discussion with my university students on the subject of aging and leisure and the physical and mental effects of aging on our bodies and on our society. When we age, of course our bodies naturally slow down. My students took a short, online assessment “How Long Will I Live?” and had to write their reaction to the number provided. (Click to take the test–it’s free and interesting). Some students were afraid to see what that number might be, hesitant to face their mortality. Others saw it as a wake-up call to become more healthy while still young. Most got a number between 77-94 years of age. When I read the theme of the Weekly Photo Challenge, Wish, I knew I had to share something about our wishes for good health and a long life. Our allotted 80-ish years on this planet are fleeting and should never be squandered. With that said, sadly we take our own time for granted, then gradually lose touch with our elderly loved ones. The lovely ladies in the above photo are all in their 80s, with two of them not in the best of health. 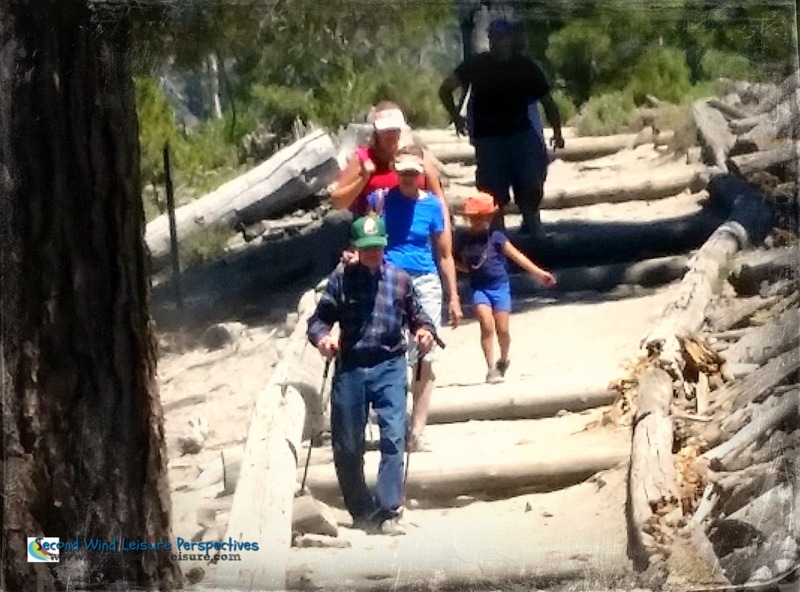 In the photo below, my father is hiking Mammoth Lakes with his brand new trekking poles…on his 80th birthday! It took a lot of coordinating with the family to surprise him with this trip. My dad and mom took us to Yosemite as young children and forever planted the love of the outdoors within our hearts. This was a tough hike, he admitted later, but you would never had known that day. Dad loved his trekking poles he got for his 80th birthday! Here is a photo of my mom, who at age 76, continues to reside in a convalescent home because she cannot care for herself. In this picture, nine years ago, she was able to use her walker and stroll along her beloved San Diego beaches. Mom and me in San Diego at Thanksgiving, 2008. 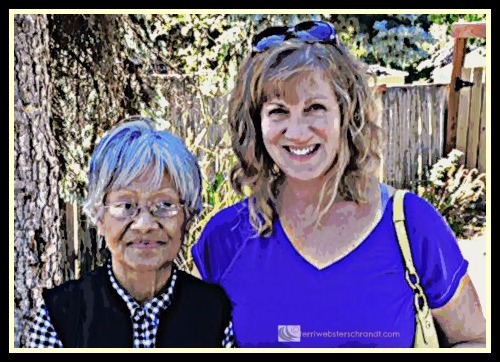 In this photo below is my spunky, Auntie Kim, who began life as a Korean orphan. Now in her early 80s, she is still going strong! She lives near her oldest daughter, my cousin. Auntie and Me in Oregon. Oh, how I wish I could spend more time with these precious ones. My aunties and mother-in-law live in the Pacific Northwest, my mother in San Diego. At least my father lives within a two-hour drive. Sometimes distance limits our time together. Mortality surely limits our time together. But we can still wish. Make the best of your time with your loved ones before that time runs out. It will, no matter how much you wish it differently. Such a poignant piece, Terri. I have no older relatives now. Mum & Dad both died well over 30 years ago and aunts and uncles have long gone. I do have a cousin, who is my godmother and was like a daughter to my Mum and Dad. She is 75 and so special in my life. She has always been there for me. There was a period when I lost touch and that is my one regret, however, we have reconnected and I treasure every moment I talk to her. She lives in another State, so I don’t see her often but I look forward to our weekly chats. Thanks for such a wonderful message to us all and sharing at #MLSTL. I’ll be sharing on social media. There are so many things I wish I had asked of my grandparents when they were still here. I tell my grandchildren all of the time to ask me anything so they might not have regrets when I am gone. That is a great suggestion, Victoria! I’m a new step-grandma but it will be a couple years before the questions begin! It’s a tricky balance when your parents and others who you hold dear start to age and you know they won’t be around forevere – add distance into the mix and it gets even more difficult. My mum is planning on moving closer to us when she starts to need more help – it will save us the 2 hour drive to help her and will mean more time together in her older years. I strive to do this every day. Life obligations sometimes get in the way, but at the end of the day family is number one. You never know how much time you (or they) have. I did oral history projects with all my relatives who went through the Great Depression and WWII. I’m so glad I did. I learned so much that never made it into history books, and I got to know them better. It’s an activity I highly recommend. That is great to hear, Cathleen. This is so so important. The moments with the family elders is precious! Love the photo of your dad hiking. Hi :), http://lisadorenfest.com/a-brief-introduction/#comment-32142 Lisa sent me here that maybe you’ll be able to help me :). I will email you my thoughts! So, I’m going to live and blog until the grand age of 91, Terri. That suits me fine. 😀 I hope man will have landed on Mars by then. Great to hear, Hugh! That is indeed a beautiful quote about the flowers! This is beautiful Terri but it made me miss my parents. On Saturday it was my Dad’s 36th year anniversary of his passing and in June it will be my Mum’s 30th. Time flies and both only lived until their mid 60s. I would love to spend some time with them. Life is short. Thanks for this lovely reminder. Great post and so much truth behind it. As you know, my parents live far, far away from us… we hope to camp together! I miss them every day, it’s really hard to be this far away from them. However, it makes me treasure the time we DO spend together! I took the quiz, and got 93. My grandkids better come and visit me lol! This is a beautiful post, Terri, with a very important reminder. Thank you for sharing this. P.S. I scored ’95’ on the life expectancy test that you included. On a similar quiz that I took two years ago, I scored ’86’. Thanks, Donna, I got 97. Maybe we should hang out together in our 90s, lol! I love this Terri. I have lost so many of my parents’ generation with only one beloved aunt remaining on both sides of the family. And my older siblings are getting up there in age too. I treasure the time we have but it is too infrequent for sure. Your post is a lovely reminder to make time. Our elder family members are all deceased now and I miss them dearly. I loved visiting them whenever possible and my last living Aunt started writing in her 70s. When she died at 90 she had published one book and had three others she was working on. My grandmother and another Aunt started painting later in life and became quite good over time. They would take classes and paint with the guy on TV. If only there was one more day to get them at the table for a cup of tea and to listen to their stories. Nice post – thanks for the memories. Looks like I’m aiming at 90 so I better continue to work for another decade or so. Oh, thanks for sharing your wonderful comment! A lovely thought to remind us of what matters most. Thanks. Heehee, well we try to like each other anyway, Miss Tess! Excellent reminder about what is really important in life. I’m happy to say that I’m one of those who can attest that I’m glad I did, especially with my mom no dad before they passed. Wonderful photos Terri and you are so right! We need to spend more time with our loved ones before it is too late. I will admit that I sometimes take for granted the time I get with both my mom & stepmom. The blogging has made it so we do spend more time together—and I need to remember to be thankful for that!! i wish I had more time with my grandmother before she got Alzheimer’s. Aww, isn’t that hard? My mom has dementia but can still have a decent conversation if it’s before dinner. My mom is 82 and has dementia. It is hard not being able to share what’s going on in your life with your mom.